NEW INITIATIVE: Taib (second left) being briefed by TH Properties group managing director Dato Roszali Othman on the features of the proposed complex. With them are Jamil (centre back), Housing Minister Datuk Amar Abang Johari Tun Openg (left) and Tabung Haji chief executive officer Dato Paduka Ismee Ismail. KUCHING: The proposed Haj Complex and TH Hotel, which is set to be operational in 2017, will be useful for Muslims who aspire to perform the Haj pilgrimage. Pehin Sri Abdul Taib Mahmud hoped the people would not see the complex as merely a facility. They should also view it as a platform for early discussion and learning before going on their Haj pilgrimage as it would be a One Stop Centre that offers many services, he said. “The complex will provide opportunities for Muslims, especially those who are planning to go on their Haj pilgrimage, to come together for inquiries, applications as well as immigration procedures. “There is a need to know in advance the situation in the Holy Land to avoid potential problems from arising. Every year there are many people from all over the whole going to Mecca for their pilgrimage,” the chief minister said at the ground-breaking ceremony here yesterday. 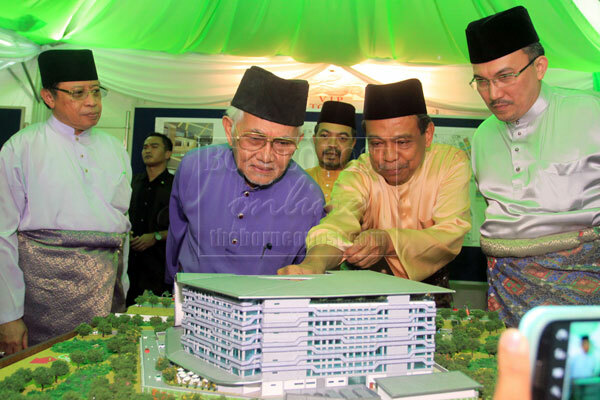 Taib commended Tabung Haji for taking the initiative to build the facility, which is for the comfort and convenience of not just Muslims but also visitors and tourists due to its strategic location right opposite Kuching International Airport. Meanwhile, Minister in the Prime Minister’s Department Dato Sri Jamil Khir Baharom said the project would be the sixth Haj Complex and TH Hotel in the country to be developed by TH Properties. It is part of Tabung Haji’s efforts to provide better services and convenience to Muslims. He said the nine-storey hotel would have 235 rooms. The complex itself has numerous facilities, including banquet halls, restaurants, banks, covered swimming pool for women and others. There may be other facilities as well, such as a shopping mall to make the place even livelier. “The complex, which sits on a 6.16-acre land, will have eco-friendly buildings that showcase Sarawak’s cultural uniqueness, including Pua Kumbu designs and Rainforest-inspired landscaping. Jamil stressed that having the complex would not affect the number of Hajj pilgrims from the state.